This practical guide offers everything you need to know – what needs to be done, by whom, and by when. With a straight-forward approach it proves that getting through revalidation is a simple task, as long as you understand the key requirements and avoid potential pitfalls along the way. It explains the process and encourages you to explore possibilities for your own personal and professional development. About the author. List of abbreviations. Section 1: The overall architecture: who does what and when. What this book is about. Your licence to practise medicine. The overall architecture of revalidation. The General Medical Council's role in revalidation. The responsible officer's role in revalidation. The appraiser's role in revalidation. The individual doctor's role in appraisal and revalidation. Personal development plans. Section 2: The evidence you need to produce for revalidation. The General Medical Council's requirements for revalidation evidence. Quality improvement activity. Significant event audit. Continuing professional development. Multiple source (colleague) feedback. Patient source feedback. Response to concerns and complaints. How should I present this evidence to my appraiser? Sessional doctors and other atypical scenarios. Section 3: Reflections and background: the reasons behind revalidation. Why is reflective learning so highly valued? Some thoughts about feedback. How can revalidation benefit me? 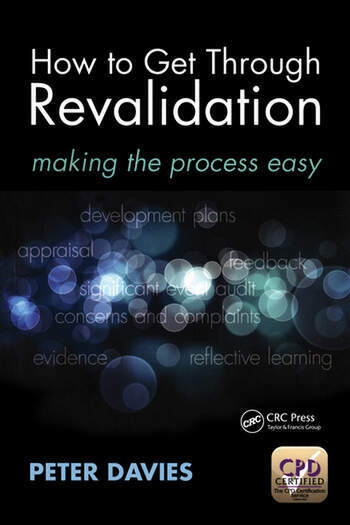 Does revalidation actually achieve its objective? Appendix 1: How to stay sane and healthy as a doctor. Index.